The modern tendency towards sending more SMS than email or phone calls simultaneously creates challenges – and opportunities – for companies that take pride in their customer service offerings. Read on for some ways your team can benefit from communicating with customers via SMS. SMS isn't just for prospecting! Customer service teams looking for better ways to resolve issues quickly and efficiently are the perfect use case for text messaging. This doesn’t mean that businesses must abandon any kind of automated customer service program, since there are circumstances when people will need to talk to a person on the phone, or when they don’t mind pressing a few buttons for a simple transaction like making a payment. Adding SMS for customer service or utilizing RCS messaging (a newer communications format that provides the ability to share other features like web snippets, image carousels, and more) can be an excellent way to round out business offerings and ensure customers have additional methods to contact you. Customer service agents should only have one conversation at a time; putting someone on hold to help another customer or taking extra time to find an answer both have the potential to further aggravate people. With text, an agent has the ability to hold several text conversations at once. This will allow them to help more customers throughout the day, research on a desktop while texting on another screen. The customer has a faster, more satisfying experience, which will help them feel good about your company and are more likely to use this resolution method in the future. The agent can solve problems quickly without having to have a phone conversation with unhappy callers, which will increase job satisfaction. Still have questions? Users can continue the conversation, rather than going back to "Main Menu"
A text can also quickly initiate a conversation, rather than a customer calling a number and waiting, a process that may take minutes but can feel like hours. Texting provides a simple option to contact customers who have opted-in to receive information and updates from your business. The recipient can receive announcements about a promotion you're running, confirm upcoming appointments and order status updates. This level of service can even be more appealing to customers; rather than having to call to approve an appointment, they can simply text back "Confirmed." See? SMS isn't just for sales prospecting! But if your Sales team isn't using SMS yet, get them on board. 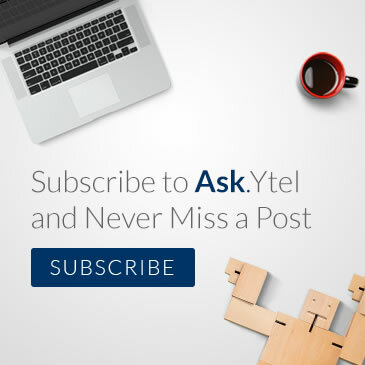 Alex is one of Ytel's finest Customer Success Managers. He onboards and trains customers on Ytel Contact Center and makes sure they are set up and prepared to be successful using all of our solutions.